Imagine being in a car crash, lying unconscious and bleeding in an ambulance. With no blood on board, paramedics give you an experimental substitute, but even at the hospital, you get fake blood for several hours before doctors try the real thing. Medical ethicists say a study that is doing just that on hundreds of trauma patients without their consent should be halted. It's a renewed attack on research that began in 2004 after Northfield Laboratories got federal approval for its study of the blood substitute Polyheme. Debate was reignited by a Wall Street Journal story last week that suggested the company tried to hide some crucial details about another blood substitute study back in 2000. The Journal reported that 10 heart surgery patients in that Polyheme experiment had heart attacks, while other patients given real blood did not. The Evanston, Ill.-based company halted that study and hasn't published the full results, but Northfield Chairman Dr. Steven Gould says there were no attempts at secrecy. Gould said Tuesday that Polyheme didn't cause the heart attacks or disproportionately more deaths. He said the study was stopped, not for safety concerns, but because enrollment was declining and the company wanted to focus on trauma research. The current study should never have begun, said Nancy M.P. King, a University of North Carolina ethicist who co-authored articles for an ethics journal. She and colleagues wrote that real blood shouldn't be withheld from people who need it without their consent. "There is a serious ethical flaw in this complicated and novel study," says the article to appear next week on the Web site of the American Journal of Bioethics. Finding a viable blood substitute would revolutionize emergency medicine and could potentially save millions of lives. The idea is to create a product that works like human blood but could be carried in ambulances and given quickly to people of any blood type. Baxter International Inc. halted research on its contender in 1998 when more than 20 patients given the substitute died. Northfield now seeks to lead the race and says Polyheme fits the bill. 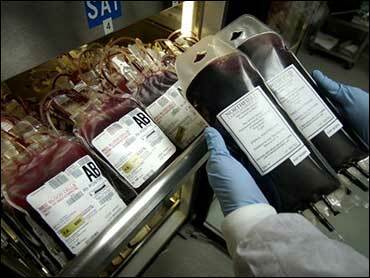 It is made by extracting oxygen-carrying hemoglobin from human red blood cells. Unlike saline fluid, the standard pre-hospital trauma treatment, Polyheme has some of blood's tissue-nourishing properties, Northfield says. The company's previous study — from 1998 to 2000 — involved hospitalized patients with defective heart arteries who consented to get Polyheme. Northfield's stock sank nearly 28 percent after the Wall Street Journal reported there were 10 heart attacks among Polyheme patients. Company stock rebounded later that day and closed up about 2 percent Wednesday, but that's still nearly 13 percent lower than before the report. In the current study, which began in 2004, trauma victims get Polyheme or saline fluid on the way to the hospital. Once there, Polyheme treatment continues for up to 12 hours, while those on saline get blood transfusions. More than 600 patients at 31 trauma centers in 18 states are enrolled in the study, and preliminary results are expected later this year. The ethicists say the problem with the study is when the patients arrive at the hospital. Testing Polyheme against blood should be done separately in patients who can give consent or who have family members who can consent, wrote King and University of Hawaii ethicist Ken Kipnis and Philadelphia anesthesiologist Dr. Robert Nelson. Kipnis said if the hospital phase can't be eliminated, the whole study should be suspended. Some hospitalized patients inevitably will die because of their injuries, but they will have died "while being denied an available treatment (blood transfusions)," the authors wrote. A separate journal essay by Duke University ethicist Karla FC Holloway says the study, in mostly urban hospitals, disproportionately exposes minorities to questionable science. The trauma study was approved under a federal "informed consent" exemption that applies to emergency research. It requires community briefings in which residents can opt out — in this case by getting plastic hospital-style bracelets in case they are injured and unconscious. But King says community briefings have not made it clear that patients will get experimental treatment and not blood transfusions for several hours even while in the hospital. Many briefings also did not mention the previous Polyheme study, and withholding that information was unethical, the ethicists said. King noted that in January, Northfield sued to keep a weekly San Diego newspaper from publishing information about the trauma study, arguing that publication would unfairly reveal trade secrets. "So much about this trial is secret because the FDA doesn't release information to the public about products that are being developed by commercial sponsors," King said. Gould dismissed concerns about ethics and secrecy and said periodic reviews by an independent monitor have deemed the trauma study fit to proceed. A Northfield spokeswoman said a survey of 12 study sites found that more than 2,000 people had requested "opt out" bracelets, mostly for religious reasons. Also, 11 of the 600-plus patients dropped out during the study's hospital phase, she said.